Here is another of the many variations possible with thedough based on leavened desserts: a very tasty sweet focaccia with apples. The last time I put it on the table was a battle at the last slice! I have already proposed many potato salads; I like them all and I always see them put on the table of every kind. I do not want to deprive anyone of the pleasure of trying it. 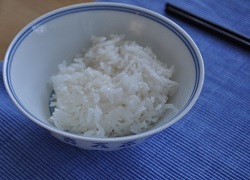 An ideal rice preparation to accompany exotic dishes is this variant, with the scent of coconut, of the classic BaiFan (白饭), white rice with Chinese. even though I prepared this preparation on my own, without looking for it in books and cookbooks. And I liked the result; as was also pleasing to my guests. How many times it seems to us that the béchamel on baked pasta (or another preparation to be baked in the oven) is not exactly what we would like. Most of the time, we are satisfied with mixing grated Parmesan cheese and baking it. But ... there is Mornay sauce, a very useful sauce not only to bind vegetables to be baked in the oven and to enrich fish and white meats during the gratin.